HBO has just launched a new interactive campaign, so I thought i'd single it out before moving on to another industry. If you read my last post (A&E), I was talking about bringing interactivity to the viewing space. Coincidentally enough, that's just what HBO has done with their HBO Imagine campaign. Turn the box to watch the drama from a different viewpoint. Or zoom out to choose a different node of the story. 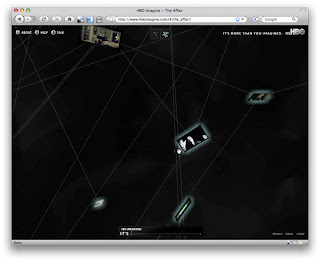 The web of story, flattened for you to keep track of what you're seen. I wont' go into details on the story I've watched so far....but there is a "drowning mime" scene.